CuT&NoT - Rift Currencies and Notorieties Tracker (was CUT). CuT&Not is the evolution of CuT, now it tracks currencies and notorieties. - Tracks Currencies for current session, current day and current week. - Tracks Notorieties for current session, current day and current week. 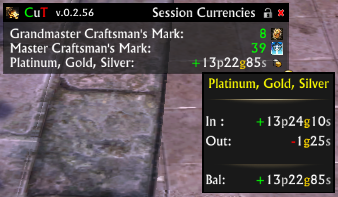 2 -> Clicking on "Session Currencies" cycles between "Session->Today->Weekly" both for Nurrencies and Notorieties. 3 -> Clicking on the lock locks/unlocks the window, when unlocked move it with RIGHT-mouse click+drag in the central panel (not on teh title bar). 4 -> Clicking on the "X" closes the window, click on the minimap button to re-open it. 5 -> LEFT click cycles between currencies and notorieties in same view (session, today, week). RIGHT click show/hides titlebar (tiny view). Movement: to move the window and the minimap icon use RIGHT-click + drag. Language: should be language agnostic. Mouse Wheel: on main panel zooms fonts.